This distressed country-rustic yellow picture frame represents a unique look for specific home decor items where a vibrant yellow color would complement equally bold colors in a country setting, such as paintings of roosters, Easter eggs, bright colored farm scenes, and children’s art. The profile width of this rustic yellow picture frame is 1 ½”, and the rabbet depth is ½”, so matted art on paper, canvas boards, rigid hardboard panels and other thin items are most ideal in this frame. 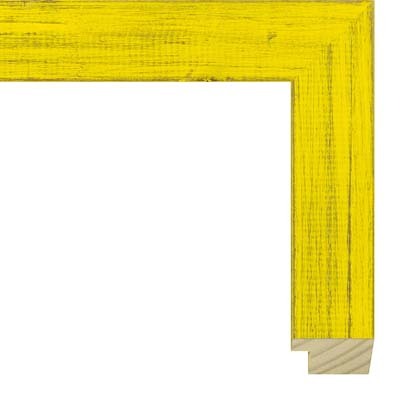 In a stacked frame combination, this distressed country-rustic yellow picture frame could also act as a liner inside the lip of another frame, such as V1300 Black, V678 Red, or V516 Blue. Mats to consider with this yellow picture frame include bold colors from our acid free selection, such as Teal Teal 9891, Lawn 9896, Electric Blue 9888, Pharaoh 9554, Dark Purple 9886, Red Hot 9899, Orange Ade 9833, Omelet 9523, and Jet Black 9848. Perhaps the best use of this picture frame is actually in framing vibrant sunsets painted or drawn by your budding artist children. Also children’s book illustrations that feature yellow, including themes of yellow rain boots, umbrellas, bananas, yellow submarines, and yellow hats such as Curious George could all be appropriate pairings with this yellow frame.